SYDNEY, N.S. - Jennifer Jones can stand alone as the most decorated Canadian curler in history this week at the Scotties Tournament of Hearts. A first-place finish in Sydney would give the 44-year-old a record seventh Canadian championship in her terrific career, surpassing Halifax’s Colleen Jones and long-time teammate Jill Officer. Is that thought on the mind of the Winnipeg native? Well, not until people started asking her about it over the past few days. “I wasn’t really [thinking about it] until today. I’ve been asked about it a bunch of times,” Jones told reporters. Jones will compete in her 14th Scotties and the fifth wearing Team Canada colours, something Jones appreciates every time. Two of her Scotties titles (2009 and 2010) have come as Team Canada which is automatically given to the rink who was victorious the previous year. 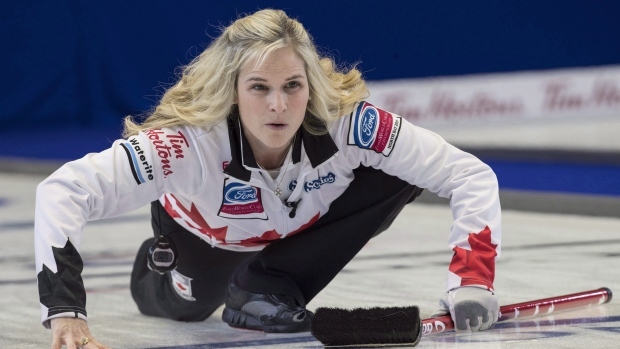 Despite winning last year in Penticton, B.C., Jones received an exemption to return to this year’s tournament as Team Canada after only two members of her Scotties-winning team returned this season, one short of Curling Canada’s rule of three. Last year, Shannon Birchard spared for regular third Kaitlyn Lawes, who had Olympic commitments in mixed doubles, while Jill Officer stepped away from the game in the off-season and was replaced by Jocelyn Peterman. Curling Canada exempted Jones because mixed doubles wasn’t an Olympic sport when the rule was created. The field in 2018 was without big names such as Rachel Homan, Chelsea Carey and Krista McCarville. It’s a different story this time around and Jones is ready for the challenge. Homan defeated Jones in the 2013 Scotties final, 9-6, for the first Canadian championship of her career. She would get the better of Jones in the semi-final of the 2017 Olympic trials too, beating the defending Olympic champion in her hometown of Ottawa. The two world-class skips have played each other three times this season with Jones taking two of those contests, most notably in the Canada Cup semi-final in December. They’ll have to wait until the championship pool before they have an opportunity to square off as they start the tournament in different groups. Jones’ first Scotties title came back in 2005 in St. John’s, Nfld., thanks to a miraculous in-off winner that has gone down as one of the best in the history of the sport. Despite her growing resume of accomplishments which includes nine Grand Slams, two world championships and an Olympic gold medal, Jones is taking everything in stride. “Even in our first Scotties in 2002, I just thought if we never got back my dreams would be fulfilled. Then we won in ’05 and I thought ‘Wow, we are the luckiest people in the entire world,’ we’re good and everything on top of that has just been gravy,” said Jones. Not only can Jones make history in Sydney this week, but she’ll be in the running for another prestigious honour. TSN compiled a panel of 31 writers, broadcasters as well as former and elite-level curlers to vote on the greatest Canadian curlers of all-time. The results for the best lead, second, third, skip and team will be revealed during the week at the Scotties. Then on Saturday, the top 10 Canadian women curlers of all-time will be revealed. Visit tsn.ca/curling all week long to find out the winners.